To read about our Church History in Albanian, please click here. The prehistory of the Albanian people and their language is shrouded in mystery, but they are certainly among the most ancient peoples of the Balkan Peninsula. They are believed by many to be descendents of the Illyrians, the original Indo-European settlers of the eastern coast of the Adriatic Sea. Today, Albania is a country of some 3.6 million people bordering Greece, the former Yugoslav Republic of Macedonia, Kosovo and Montenegro. Beginning before the time of Christ, the territory of Albania was ruled by the Romans, who constructed the Via Egnatia from Durres (Dyrrachium) through Albania to Byzantium and built important cities including Butrint and Apollonia, to which Julius Caesar sent his nephew, the future Emperor Augustus, to study. Christianity was brought to the territory of present-day Albania by St. Paul, who visited Durres in the first century A.D. In A.D 732, the Byzantine Emperor placed the southern part of Albania under the Patriarchate of Constantinople, while the northern part was dependent on Rome. Ottoman rule began in the late 14th century, although forces led by Gjergj Kastrioti Skenderbeg drove the Ottomans back between 1443 and 1478. Until November 28, 1912, Albania remained a province of the Ottoman Empire. Despite almost 500 years under the Turks, the Albanians always considered themselves a distinct and separate ethnic group. The Albanians who immigrated to America in the early 1900s were simple, unsophisticated people, bringing with them the customs and traditions of the Old Country. The majority of immigrants who settled in the Chicago area were of the Orthodox faith, although Albania’s population includes Muslims and Catholics as well. Today, second-, third- and fourth-generation American-Albanians continue to observe the holy days and customs of their ancestors. In the spring of 1944, twelve men of Albanian descent decided that the time had come to organize a church for their community of Orthodox Christian families who had immigrated to the Chicago area during the 1920s and ’30s. The men began meeting in their respective homes and by summer had decided on a name for their church: the Albanian Orthodox Church of St. Nicholas. The new church was incorporated and recognized by the state of Illinois on June 18, 1944. The founders then focused on the most difficult task before them: soliciting donations for the purchase of a building where the Albanian Orthodox community could worship. After almost three years of fundraising, enough money was raised to allow them to start looking for a permanent building for their house of worship. On March 1, 1947, the Albanian community of St. Nicholas purchased the former Danish Evangelical Lutheran Church of Chicago, located at 1655 N. Rockwell Street, for the sum of $6,000. Application was made to the Diocese of the Albanian Orthodox Church of America for formal status as a canonical Albanian Orthodox Church, and official recognition was formally given by Bishop Fan S. Noli. Bishop Theophan Stylian Noli was not only an outstanding leader of the Albanian-American community, but also a pre-eminent and multi-talented figure of Albanian literature, culture, religious life and politics. Ordained a priest in 1908, he was consecrated on November 21, 1923, as Bishop of Korca and Metropolitan of Durres. For a short period in 1924 he served as prime minister of Albania. Having spent time in the United States, including earning a degree at Harvard, he returned in 1932 and died in Fort Lauderdale, Florida, on March 13, 1965, at the age of 83. Within a very short time, Reverend Haralamb V. Dode was appointed as the first priest for the newly formed St. Nicholas Albanian Orthodox Church. The community of St. Nicholas grew and flourished. In 1952, the St. Nicholas Albanian Orthodox Church of Chicago decided to follow Bishop Mark I. Lipa, the spiritual head of the Albanian Orthodox Episcopacy, headquartered in Boston. The ordination of His Grace Bishop Mark I. Lipa to the Episcopate of the Orthodox Church on September 10, 1950, brought a new spirit of life and purpose to the Albanian-American religious community. In 1951 he initiated a weekly religious radio program, and in 1958, he commenced publication of a monthly diocesan newspaper. Both were in response to the missionary needs of the Albanian-American Church. With undaunted courage nurtured by his faith in Jesus Christ and a determined resolve to serve the Church, Bishop Mark advocated the causes of human rights and religious freedom for people everywhere, including Albania. He also supported the preservation of the Albanian heritage and culture, including language and ethnic traditions. Bishop Mark appointed the Reverend John S. Chaplain, who was ordained in 1951, as priest for the St. Nicholas Community. Though the St. Nicholas community was happy with their church on Rockwell Street, many of the St. Nicholas parishioners yearned to build a new church. In 1954, under the spiritual leadership of Fr. Chaplain, a “New Church” committee was formed and preliminary plans got under way. Many decisions had to be made, such as how and where they would build the new church and, more important, how to raise the funds necessary to accomplish this dream. As the building fund committee worked, there was a temporary setback in the fall of 1955 with the untimely passing of Fr. Chaplain. Fortunately, the newly appointed priest, the Reverend Michael Dali, stepped in and kept the momentum of the building fund committee on course, focusing on its main objective. The Reverend Protopresbyter Michael Dali served St Nicholas Albanian Orthodox Church for 30 years as pastor and another 10 years as Pastor Emeritus. He was astutely intelligent and ambitious. This was demonstrated by his tireless efforts in generating the necessary funds to build and maintain our church building and parish community. In addition to his business acumen and tenacity, his affection toward the parish was displayed by his sincere devotion and ministry to his church family. In April 1957 the first part of the objective was achieved. A parcel of land was purchased at the corner of Narragansett and Schubert avenues for the sum of $20,000. This expenditure came close to depleting the entire church treasury; therefore, the next three years were spent on fundraising, but with limited success. In 1960, at the first meeting of the newly elected 1960-61 parish council, it was resolved that the new church and hall would be built within the next two years regardless of the obstacles. There was approximately $8,000 in the church treasury. Raising money remained the key problem. Despite the slow progress, the first thing the parish council did was to hire an architect to draw up a plan for the new church. The first set of plans was unaffordable. The parish council hired a new architect, Torgny Westerberg, who better understood the financial restrictions of the community and proceeded to draw new plans accordingly. With only a few slight modifications, the plans for the new church and hall drawn by Mr. Westerberg were unanimously approved by the parish council. Inadequate funds continued to be the main obstacle holding up the start of the construction of the new church building. Fundraising events, such as raffles, picnics, dinners and dances were planned and held. But the amount earned from these functions combined with individual pledges was still not enough to allow construction to start. The first break came in September 1960 when a buyer, Marian Fathers, came forward to purchase the church on Rockwell Street for the Roman Catholic Latvian community; the church was renamed Our Lady of Aglona. The sale of the church on Rockwell Street for the sum of $25,000 gave fundraising efforts a shot in the arm, but the total funds raised still fell short of the amount required to get construction started. The amount needed was $100,000. The only way such an amount could be raised was through a bank loan. Unfortunately, the church did not have the collateral to obtain a loan of that size. Just as things were starting to look truly dismal, five parish council members came forth and said they would personally sign the loan papers so the church could get the $100,000 loan that was needed. These five men — John Dimas, William Dimas, George Samatas, Gust Sutter, and Steve Themely — are honored as Benefactors of St. Nicholas Church. Groundbreaking ceremonies took place on Sunday, December 18, 1960, with His Grace Bishop Mark presiding. Construction started soon after that. An adjoining property was purchased in April 1961 to provide space for a parking lot. While St. Nicholas Church was under construction, our Orthodox brothers and sisters of Assumption Greek Orthodox Church graciously allowed us the use of St. Catherine chapel for religious services. The construction of the church building was completed in late summer of 1961 and a grand opening dinner dance was held on October 8, 1961. Since the opening of the new St. Nicholas Church, much has happened. On October 10, 1971, parishioners witnessed the consecration of the church, a sacred and solemn service wherein the deposition and sealing of the Holy Relics in the altar table takes place. In 1972, Father Dali was instrumental in procuring pledges totaling $40,000 for the Burning of the Mortgage. In 1979, Bishop Mark was laid to rest. As the Albanian Diocese did not have a bishop to take his place, St. Nicholas parish opted to remain independent and be directly under the jurisdiction of the Ecumenical Patriarchate of Constantinople. In 1984, Fr. Dali retired and the Chicago Diocese appointed a new priest, the Very Reverend Archimandrite Philip Koufos. Fr. Philip attended and received his theological and artistic training in Byzantine Iconography at Holy Trinity Orthodox Seminary in Jordanville, N.Y., where he received his B.A. in Theology. Fr. Philip went on to receive his B.A. in Anthropology from Buffalo University, and later attended Kent State University, where he earned a Master of Arts in Anthropology. He was ordained into the Holy Priesthood on July 4, 1966, and was appointed pastor of St. Mark’s Orthodox Church in Youngstown, Ohio. For five years he taught anthropology, archaeology and sociology at Youngstown State University. In 1973, he was elevated to the rank of Archimandrite and became a lecturer at St. Vladimir’s Orthodox Theological Seminary in Crestwood, N.Y. In 1984, Fr. Philip was appointed pastor of St. Nicholas Albanian Orthodox Church, and with the help of God and the parishioners, revitalized the parish. The church prospered and grew. With membership increased from 200 to 300, an addition was built in 1988 to house the Sunday school classrooms, the clergy office, and the Albanian Cultural Center, a registered center in the state of Illinois. Groundbreaking ceremonies took place on November 27, 1988, with His Eminence Metropolitan Iakovos presiding. This addition was designed by Mr. Torgny Westerberg, the architect who designed the original St. Nicholas Church building. In December 1986, the most profound event to occur at St. Nicholas took place: the miracle of the weeping icon of the Blessed Virgin Mary (click here for the full history). The tears continued to spill through July 1987 and again for a brief period in September 1987. The weeping icon, which is referred to as “Our Lady of Chicago” or “Shen Maria Shqiptarevet,” has been visited by thousands and thousands of people, and continues to draw the faithful. On July 22, 1990, during his tour and first visit to the United States, the Ecumenical Patriarch, His All Holiness Demetrios I, came to St. Nicholas and venerated our holy icon: an extreme honor for this small Albanian community. 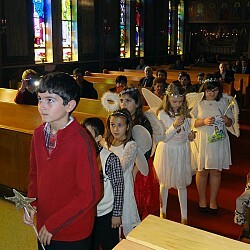 As he walked from the narthex toward the altar, his eyes shone with kindness and his presence radiated the love of God. After he venerated our icon and kissed the altar, he presented Fr. Philip with a pectoral cross and a cloisonné sensor (or themianitsa). The succeeding Ecumenical Patriarch, His All Holiness Bartholomew, also made a pilgrimage to our church to venerate our holy icon during his visit to America in November 1997 — yet another honor bestowed upon our parish. In the early 1990s, Albania ended 44 years of communist rule in favor of democracy. The doors were finally reopened for Albanians to immigrate to America, reuniting families and ensuring the continuance of our Albanian community in Chicago. Per shume vjet! In September 1997, a small delegation of parishioners along with Fr. Philip visited the Ecumenical Patriarchate of Constantinople as goodwill ambassadors for our community. They were received with open arms by His All Holiness Bartholomew. They visited holy shrines and churches and were given the grand tour of the Patriarchate and surrounding areas. In 2002, the Holy and Sacred Synod of the Ecumenical Patriarchate elected His Grace Bishop Ilia Katre as a Titular Bishop of Philomelion to lead the Albanian Orthodox Diocese of America. The ordination took place in Constantinople (Istanbul) on May 12, with the blessings of His All Holiness Ecumenical Patriarch Bartholomew. Bishop Ilia graduated from Hellenic College and Seminary at Holy Cross Greek Orthodox Theological School in Brookline, Massachusetts, with a Bachelor in Theology Degree in 1961. He was ordained to the priesthood in 1962 and served at Holy Trinity Albanian Orthodox Church until August 1983. He received a Masters of Divinity before being assigned as Dean of Student Affairs at Hellenic College and Holy Cross School of Theology. He held the position of Vicar General of the Albanian Orthodox Church of America until 2002. Were it not for the foresight of the twelve founding fathers of St. Nicholas Church — Paul Demir, Louis Dimas, Mark Ginosi, Sotir Iskalis, Christ Manika, Vito Nako, Dan Peters, Christ Skurti, Peter Sutter, Tom Tito, Naum Tona, and Sotir Treslo — none of these events would be part of our history. God bless them and those who followed them over the years with their hard work, patience and perseverance for the progress and growth of our beautiful community. We pray that God will continue showering our people with his blessings and protection.